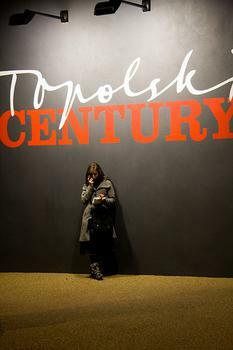 The Topolski Century was painted by Polish artist Feliks Topolski between 1975 and 1989 to chronicle the key events and the iconic figures of the 20th century such as Churchill, Gandhi, Martin Luther King, Picasso and Coco Chanel among 700 people. The Topolski Century was painted by Polish artist Feliks Topolski between 1975 and 1989 to chronicle the key events and the iconic figures of the 20th century such as Churchill, Gandhi, Martin Luther King, Picasso and Coco Chanel among 700 people. Six-hundred feet long and twenty feet high on the Hungerford Bridge arches, Topolski Century is the artist's eye witness testimony to the era that he captured and published in Topolski's chronicles. Starting from pre-war Europe and running through global events such as wartime India and the Japanese invasion of China, African independence and Pope Paul VI's visit to the Holy Land, it is Topolski's legacy to future generations.